Perhaps the most frequent metaphor for the Federal Reserve’s role in managing the economy involves a punch bowl and a party. 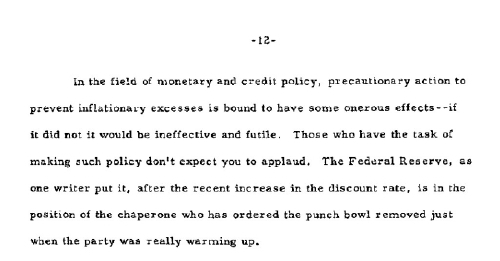 Although it is often paraphrased, the actual quote is “The Federal Reserve…is in the position of the chaperone who has ordered the punch bowl removed just when the party was really warming up.” In October 1955, Fed Chair William McChesney Martin, Jr. delivered a speech to the New York Group of the Investment Bankers Association of America. In that speech, Martin described the job of the Fed as one that requires precautionary action. He acknowledged that this precautionary action to prevent too much inflation was bound to have some onerous effects. The Fed does not expect businesses or consumers to be happy about its actions, but it is still the Fed’s job to be the adult in the room. At the time, the speech was not particularly remarked upon. Now the metaphor is used frequently by Federal Reserve officials and observers. A search of the New York Times archive for the terms “punch bowl” and “federal reserve” yields 72 results, with the first one in 1972. So while the original speech never made the New York Times, the metaphor apparently resonated so much that by the early 1980s the phrase was used with regularity to convey the Fed’s actions and intent. In the early 1980s, the phrase referred to the Fed’s role in fighting inflation. In the late 2000s, the phrase referred to the Fed’s role in ensuring financial stability. In FRASER’s collection of Statements and Speeches of FOMC Participants, there are 17 examples of Federal Reserve officials reusing this metaphor to explain the Fed’s actions. Adding the other publications in FRASER brings a total of 50 documents (including the original) that reference the Fed’s work and have the term “punch bowl.” Documents with the phrasing include nomination hearings for Federal Reserve Chair, Federal Open Market Committee meeting minutes, and articles from Federal Reserve publications. Federal Reserve officials, senators, congressmen, journalists, and economists have all found the phrase useful in describing the Fed’s actions under many different circumstances. There are actually 53 results, but the three oldest are references to punch bowls from the digitized copies of the Commercial and Financial Chronicle.